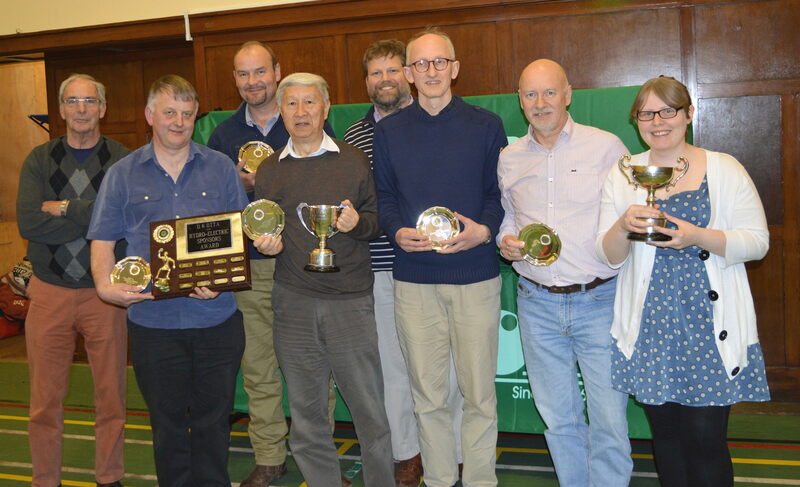 St Andrews Table Tennis Club’s Howard Lee capped off a terrific season at the club’s AGM last night when he was awarded the Graham Neilson trophy for the most improved player over the last twelve months. Howard fended off stiff opposition from a number of strong candidates but he was the Committee’s unanimous choice (with the exception of Howard’s own vote) after playing a pivotal role in helping Prefects to the DDTTA second division title and improving his personal average (win rate) from 47% in season 2013/14 to a remarkable 80% this year. Beat that. There is apparently no truth in the rumour that Howard is installing a larger mantelpiece to display his numerous medals this season, or that the damage to the Neilson trophy was inflicted ‘Calcutta Cup style’ by last year’s winner not wishing to give it up. 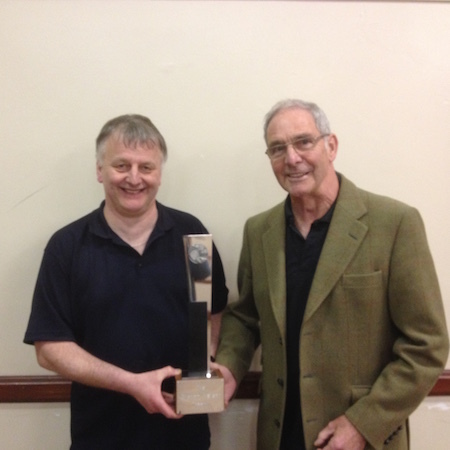 The AGM also saw secretary, Ian Smith, step down after three years sterling service. Ian’s reputation, in particular for writing quality minutes, is second to none and he will be a hard act for newly-elected secretary, Dave Beveridge to follow. Dave’s previous role as publicity officer was filled by Collin Bleak. Whether Collin can match Dave’s reputation for political incorrectness remains to be seen. The other office bearers were all re-elected. 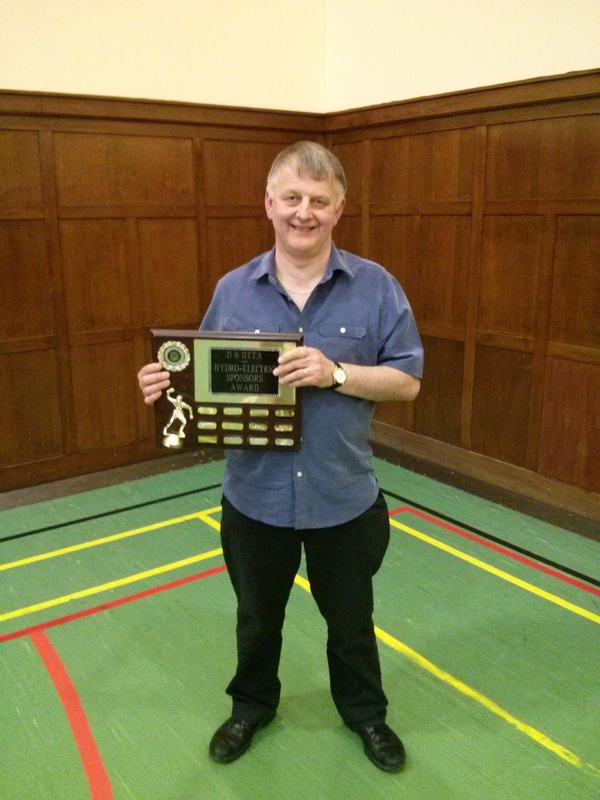 This entry was posted in Uncategorized and tagged Graham Neilson trophy, Howard Lee, Neil Lea on May 12, 2015 by standrewstt. Now that the huff and puff of the league and cup action is over for this season, the last couple of weeks have witnessed the St Andrews’ TT players enjoy collecting the spoils of their efforts. Left to Right – St Andrews’ chairman, Neil Lea, Howard Lee (Prefects), Robert Brown (Swots), Kong Wan (Captain, Prefects), Collin Bleak (reserve, Swots) Ian Smith (Prefects), Dave Beveridge (Captain, Swots) and Emma Bissett (Swots). Prefects and Swots are pictured in happy mood at the Dundee and District AGM on 30 April after being presented with their trophies for becoming Division 2 and Division 3 champions respectively. The players appear to be leaning to the left (or their right) but this is not an indication of their political affiliations. Howard Lee was also honoured with the Sponsors’ Award for an outstanding contribution to the DDTTA closed championships, a hugely improved personal average in Division 2, helping Prefects to their title, and for his contribution to coaching the district’s youngsters, including St Andrews’ first minor boys champion in over ten years (Murray Paterson). To the best of our knowledge, this appears to be the first time that a St Andrews’ player has won the Sponsors’ Award. At the East Fife Sports Council’s annual awards event on 6 May, Dave Beveridge was presented with a framed certificate marking his nomination for the Masters award, for sporting achievement by an individual over 50 years of age. Dave has gone from virtual beginner to a Division 2 league player in only three years and he makes a significant contribution to the management of our club and as match secretary for DDTTA. We now only await the announcement at the club’s forthcoming AGM of the recipient of the Graham Neilson Trophy, awarded to the club’s most improved player over the last twelve months. After such a successful season there are a number of worthy candidates – but will there be a surprise in the offing? Watch this space. This entry was posted in St Andrews Table Tennis Club and tagged Howard Lee, Prefects, Swots on May 7, 2015 by standrewstt.